Black Friday was a struggle if there ever was one. I have a small, local bank that literally thinks my card is being stolen every time I’m more than 2 miles from my home. While I’d prefer an overzealous bank to an inattentive one, it was especially annoying on Black Friday, when I had to call my bank 4 times because they kept putting blocks on my card despite me calling in the morning to notify them that I was in North Carolina and shopping 🙄. As trying of a day as it was, it was ultimately a blessing in disguise, as I was able to purchase the one thing I really cared about (my DSLR camera) and cut my shopping (more importantly, spending) early because I was so aggravated with having to call my bank between every purchase. Because I was frustrated and threw in the towel early, I only went to Best Buy, Aldo Accessories and Windsor. Apologies in advance that I was too lazy to go iron my clothes for a blog post. I got these cozy turbans 50% off at Aldo Accessories, and this thotful bodysuit at Windsor 20% off. This blanket scarf was 50% off at Aldo Accessories, and this cropped eyelash turtleneck was 20% off at Windsor. Admittedly, the deals at Windsor were nothing phenomenal, but I’m a sucker for that store, and will shop there any time I can find an excuse to. 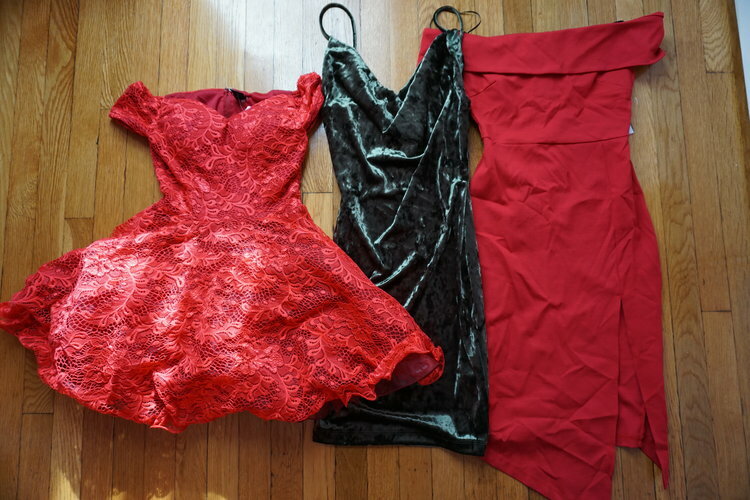 These 3 dresses were 20% off at Windsor. I purchased the off-shoulder red dress thinking it would be perfect for my job’s Christmas party, and knowing full well I wouldn’t be able to attend because I have a test that day 🙃. The deep green velvet dress will likely be my New Year’s Eve dress, but who knows if I’ll be able to restrain myself from buying something flashier between now and then. Both the bodysuit and dress were 20% off at Windsor. As you can tell, I’m very into velvet. I have a ridiculous choker collection, and I wouldn’t be me if I didn’t increase my abundance of things I don’t need. The Aldo chokers were buy one get one free and the choker on the top was 20% off at Windsor. My first, most anticipated and most important purchase of the day was my mirrorless Sony alpha 6000 DSLR camera. I’m absolutely obsessed. I think when all was said and done I saved somewhere between $400 and $500 on this bad boy. I’m still debating purchasing a tripod and drone before Cyber Monday is over, but I’m trying to control myself. These shirts were 20% off at Brave New Look, but I know that by the time they ship and are delivered, no one will be thinking about Black Friday or Cyber Monday any more. How was your Black Friday experience?